At the surface of the sea is the air pressure 1 atmosphere (1 atm). Dry air consists of 78 % nitrogen (N), 21 % oxygen (O2) and small amount of other gases. Atmospheric air also contains water vapor, about 1 % in average. Each gas in the air has a partial pressure, which is the hypothetical pressure of that gas if it alone occupied the volume of the air. When the air pressure is 1 atm, the partial pressure of nitrogen is 0.78 atm, and the partial pressure of oxygen is 0.21 atm. At 10 meters is the pressure 2 atm, and the partial pressures of nitrogen and oxygen are 1.56 and 0.42 atm respectively. At 30 meters is the pressure 4 atm, and the partial pressures are 3.12 and 0.84 atm respectively. Recreational scuba diving is restricted to 30 meters for some good reasons. First of all, the deeper you go, the more nitrogen is absorbed into the body over the same period. When you ascend, you must allow the body to get rid of as much nitrogen as possible. This is done by ascending at a controlled rate. If you stay too deep too long, you will need to make decompression stops on the way up. Too much nitrogen in the body may result in decompression sickness, which occurs when nitrogen in the body tissues becomes gas bubbles when the diver is ascending. It can be compared with a can of soda: When the can is opened, the pressure drops, and the carbon dioxide becomes bubbles. Decompression sickness requires treatment in a pressurized chamber. 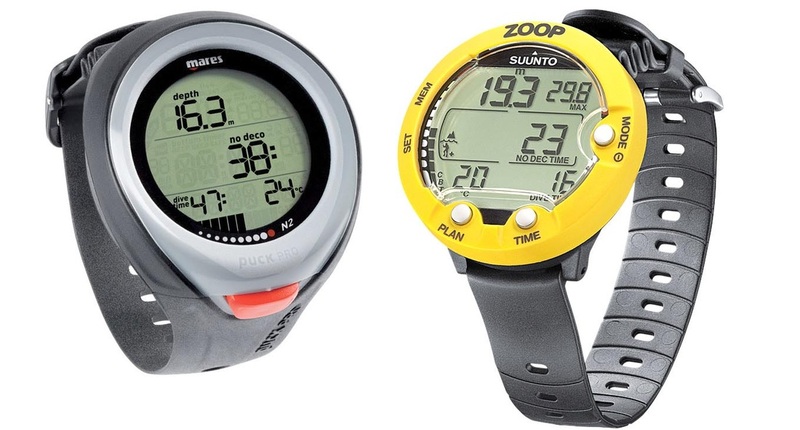 Almost every diver are using dive computers to make sure that they don’t exceed their limitations. Secondly, increased partial pressure of nitrogen causes a narcotic effect called narcosis. First, it may give a feeling of tranquility. Later may it lead to anything between exhilaration and anxiety. But your judgment is impaired, and you may make wrong decisions. Most people will experience narcosis below 40 meters. The cure is easy: Ascend to a shallower depth. A way to reduce nitrogen absorption is to increase the amount of oxygen in the tank. Such an air mixture is called enriched air or Nitrox. Normally does Nitrox contain 32 % oxygen (and 67 % nitrogen). Nitrox reduces the uptake of nitrogen in the body, which can extend the underwater time. It may also reduce post-dive fatigue. A benefit with Nitrox is that if you have two dives in succession, the duration of the second dive will be longer. Third, there’s a risk of oxygen poisoning when the partial pressure of oxygen exceeds 1.6 atm. The symptoms are convulsions and loss of consciousness. With normal air supply will you have to dive below 50 meters before this becomes a problem, but divers using Nitrox are limited to shallower depths. Recommended safety limit is 1.4 atm. Nitrox with 32 % oxygen can therefore be used down to 33-34 meters. If you were diving with 100 % oxygen in your tank, you would have to stop at 4 meters! Professional divers are using helium to reduce the partial pressure of nitrogen and oxygen. That requires a lot more training. The most important feature with a dive computer is that it tells you how long you safely can stay at the current depth. 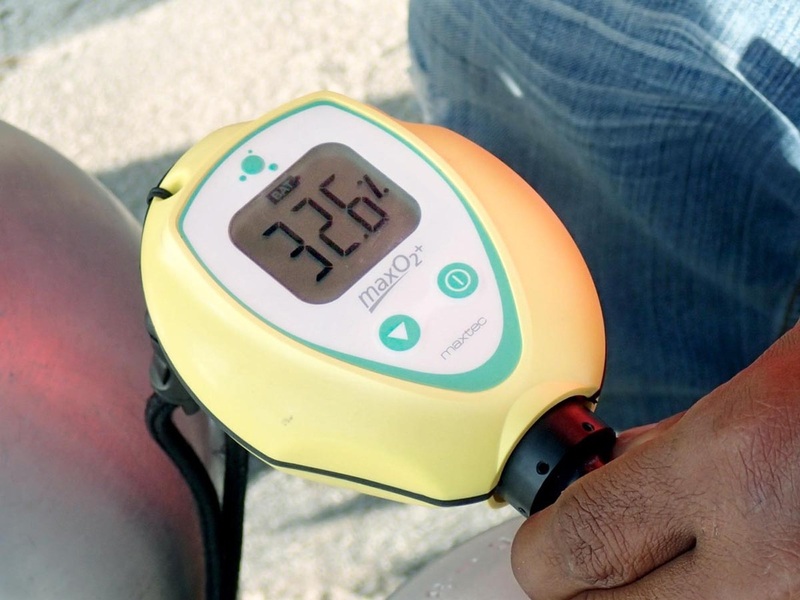 Today do every scuba diver use dive computer, which can be purchased for $ 300 and up. The cheapest models are more than sufficient for recreational diving. Before diving with Nitrox (enriched air) is it important to measure the oxygen percentage in the air tank. The value is then inserted into the dive computer.